chesyrockreviews.com: Best Holiday Ever? Oh yes! Fancy a holiday on the high seas (do I hear you say Yaaarrrrr! )with a bunch of debauched (and aging) rock stars, who cannot escape your limp clutches because they are shut up on a ship with the audience, then the 'Monsters of Rock' cruise is for you!!!! It all began one special day in August 1980 at Castle Donington, Leicestershire, England…Seven Metal Bands and thousands of rabid fans converged on the soggy turf of Donington Park and became part of rock history as a legendary event was born…the Monsters of Rock! Fast forward to February 2012…Now you can become part of music history, as the tradition of the Monsters of Rock is reborn, this time in the Bahamas aboard a luxury cruise ship. We proudly announce the Monsters of Rock Cruise, the greatest floating 80’s heritage rock festival to ever sail the seven seas! It all begins in Fort Lauderdale, FL, sailing from February 25 – 28, 2012 aboard the MSC Poesia, destination Nassau, Bahamas and Key West. This epic event will feature some of the greatest artists of the era, including Cinderella, Tesla, KIX, Stryper, Y & T, Lynch Mob, Firehouse, Black ‘N Blue, Bang Tango, Faster Pussycat, Keel, XYZ, John Corabi and Eric Martin. This is much more than a “Concert Cruise” event…it is fantasy camp for metal fans that will be talked about for many years to come! The fun will begin the moment you come aboard the beautiful MSC Poesia, meeting new friends poolside during the kickoff Sailaway Concert. This will set the tone for the next 3 days, enjoying a myriad of over the top Special Events, including the Monsters Rock & Roll Prom 1989, “So You Think You Can Shred” Competition, Shotgun Wedding Vow Renewal, Artist Meet & Greets and much, much more. In addition, you’ll appreciate the inviting Music Venues & Events, featuring our incredible artists on the Main Stage plus the Monster’s Coffee Shop, Back-Alley Stage and the Pool Deck Showcase for partying under the stars! You wont want to miss Eddie Trunk from VH1’s That Metal Show, as he moderates up close and personal Q & As with our artists called Rock ‘N Roll War Stories. Finally, our other celebrity guest, Rock of Love’s “Big John” will always be there to keep the party going…like you needed any more encouragement!! 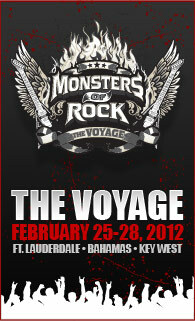 We are about to rekindle the Spirit of Donington and set the bar at a new level with the Monsters Of Rock Cruise. You simply must be there…see you aboard!